An almost perfect evening can be easily ruined by a profession of love. Moonlight streaming through the windows, the café’s comforting aromas, a nearly overflowing dining room, delicious food, poetry…and Claude. Deirdre knows she has to stop him, but she doesn’t know how. In Lake Vista, a small resort town tucked in the California foothills, Deirdre finds that there are more questions than answers. And Claude is the least of her problems. In LA, Deirdre’s perfectly constructed life made sense—a lucrative, albeit boring, career and an adoring boyfriend. But when her beloved grandmother tumbles down the stairs, Deirdre returns to Lake Vista and picks up the apron strings at Rosie’s café. Temporarily. Running her grammy’s café is more complicated than Deirdre could have ever imagined. Despite a food thief, a haunted house, a matchmaker and a handsome stranger, Deirdre believes her old, safe life can still be salvaged. 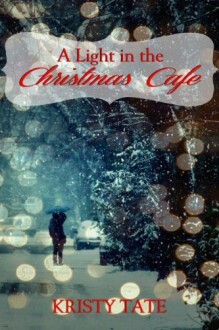 Until she sees a mysterious light in the café’s attic. A Light, that like her, doesn't belong. Or does it? This was the 7th book in the Christmas On Main Street set. I really enjoyed this clean, short story.It was a nice feel good type of read, just right for a cold winters night.It had just the right amount of romance in it.